The term paper is derived from the Greek and Latin word for Papyrus. It is believed to be used for writing some 5000 year ago in Egypt. The art of paper making originated in Africa around 400 BC. The modern paper that we use is around 500 years old. 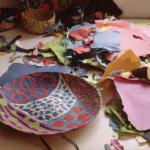 Papier mache is believed to be as old as paper making. It is a construction material with paper and paper products along with glue as its core raw materials. Though paper mache is light in weight, it is sturdy. Other advantages are inexpensive, non-toxic, non-flammable and non-hazardous. Great detailed work can be done using paper mache resulting in high quality products. It is extensively used to make beautiful utility and gift items and therefore creates an opportunity for employment generation. The art of paper mache is practiced globally and is used in school projects, house decoration, making art prototypes, casting and reproducing items, making props for theatres and movies and making wild life and animals.